One of my favourite things about Assassin’s Creed: Black Flag was its sea shanties. Taking to the open seas to the tune of ‘Lowlands Away’ was one of the best things the Assassin’s Creed series had offered up to that point. Which is why it’s particularly nice that those shanties return (albeit more traditional to Ancient Greece) in Assassin’s Creed Odyssey. In Black Flag, the crew of Edward Kenway’s Jackdaw were pretty much all male, which meant that those pirate tunes were all sung by male voices. 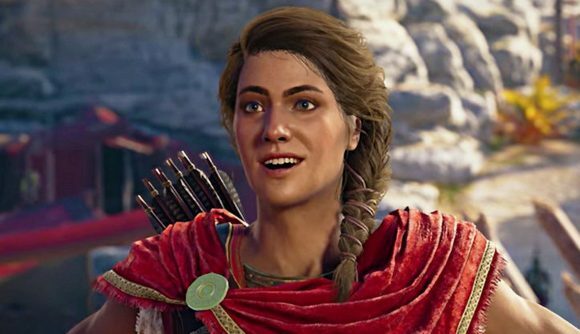 In Assassin’s Creed Odyssey, however, Alexios and Kassandra can choose to sail with either a male or female crew. Choosing the latter will mean that your sea shanties you hear as you take to the waves will be sung by a female choir. Game developer Megan Fox (not to be confused with the Hollywood actress) tweeted a video of her female crew singing as they glide across the waves of the Aegean. You can take a look at that tweet in the further down this article. There’s a haunting beauty to the female voices, which are very different to the deeper male sailors. Whether or not you opt for a female crew, however, you’ll still have the booming voice of your first-mate, Barnabas, issuing instructions to your sailors. If you’re yet to head to Ancient Greece, you can check out our Assassin’s Creed Odyssey PC review. You can also check out our guide to the Assassin’s Creed Odyssey abilities and skill tree, which will help you figure out the best build you’ll need to make your way through the latest entry in the series.